For property owners who demand the best kind of service without the hefty price tags, Egan Landscape Group is the place to go. 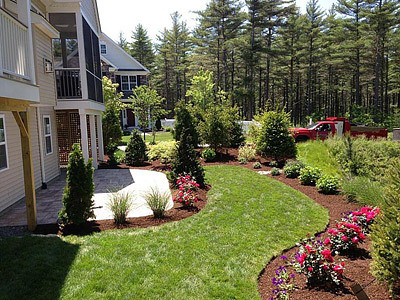 We provide owners of commercial and residential properties with affordable and comprehensive landscaping services. Our company has skilled, creative, and experienced crews with exceptional dedication to every project, whether it's a simple service or a complete yard renovation. At Egan Landscape Group, we offer personalized landscape design solutions to property owners who want a unique look for their landscape. Likewise, we ensure outstanding installation of landscape features such as new planting beds, driveways, retaining walls, and planters. We use the latest computer design tools, so you're assured of highly detailed design plans. Our crews only install landscape amenities using world-class materials and supplies. Our in-house crews can design and build any hardscape that you want for your landscape. With our seasoned builders, we create extraordinary outdoor fireplaces, patios, fire pits, pillar systems, walkways, pool decks, retaining walls, and the like. The hardscapes we create are built to last, so you will be pleased with our hardscape design and installation service. We have designed and built numerous irrigation systems for commercial and residential landscapes. We use only top-notch products and adopt modern and efficient irrigation designs, to give clients functional and reliable systems. We guarantee to give you peace of mind knowing that your landscape irrigation is built by experts. We have extensive experience in commercial landscape maintenance, so we can work on all kinds of maintenance with the utmost efficiency. Some of our clients include Laurel Wood, McDonald's, Ocean Point, The Pine Hills, and Stafford Hill. From simple mowing and trimming jobs to transplanting and irrigation system maintenance, our team of seasoned landscapers have the tools and knowledge to complete the job. We will work with little or no disruption to your daily operations, and we will guarantee top-quality results each time. If there is a company that you should trust for your landscape maintenance needs, that would be us at Egan Landscape Group. Our maintenance team is composed of seasoned maintenance crews and experts in the fields of horticulture and plant sciences. Meanwhile, our company is managed by highly experienced people with formal education in landscape care and maintenance. These capabilities and credentials are just some of the reasons why property owners choose our maintenance services. Another expertise of Egan Landscape Group is in snow removal for commercial properties. Our professional snow and ice management services are sought-after by many property owners since we work carefully and ensure proper snow collection and disposal. We have complete snow removal equipment and use industry-approved de-icing solutions to finish the job quickly and correctly without harming the environment.